T-Mobile's not being shy in its selection of Windows Phone 8 offerings, so far announcing plans to release the HTC Windows Phone 8X and Nokia Lumia 810, but unfortunately it does have to be shy in actually showing them off. The carrier's booth at tonight's event had the latter device, but wasn't able to turn it on for us (a situation that we've sadly come to expect with virtually every public appearance by a WP8 device). Technically, the 810 is being dubbed a T-Mobile "exclusive" in the US, but that takes on very little meaning when given its use of a AWS-friendly HSPA+ 42Mbps radio. It bears some family resemblance in specs and looks to its cousin, the Lumia 820, but it still keeps to a distinct design; the 8MP rear camera panel is laid out vertically (see also: Lumia 800) rather than horizontally, and the 1.2MP front-facing camera is on the opposite side of the earpiece. It's still a little thicker and heavier than we'd like, which is mainly a result of the 810's exchangeable battery covers (it's available in cyan and black). Take a look at our hands-on images below, and we'll continue to update this post with our impressions! 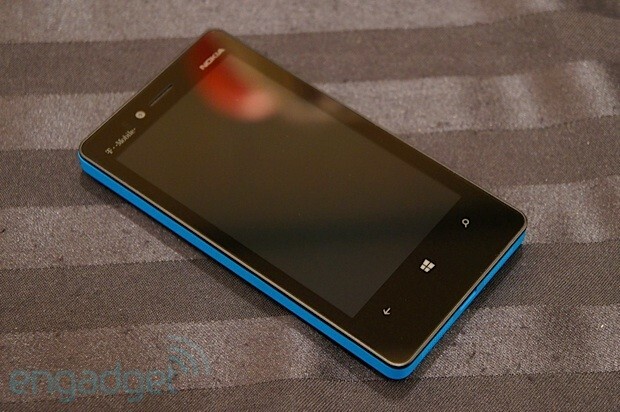 Nokia Lumia 810 for T-Mobile hands-on originally appeared on Engadget on Tue, 09 Oct 2012 23:36:00 EDT. Please see our terms for use of feeds.